Tatsumaru Omachi, Coca-Cola West Co.
We have been investigating Holocene tsumami deposits along the Pacific coast of northeast Japan in order to define the ages and source areas of earthquakes generating large tsunamis. Sediment cores were collected by using geoslicers (Fig. 1) and hand augers at alluvial lowlands interpreted by aerial photographs, and ages of deposits were dated by radiocarbon methods and tephrochronology. Fig. 1. Data collection: (a)(b) Geoslicer drilling at Rikuzentakata, (c) Handy geoslicer drilling at Rikuzentakata. All of our study areas are severely affected by the tsunami after the 2011 earthquake. Since the Pacific coast of northeast Japan faces the Japan trench where the Pacific plate subducts beneath the Eurasian plate, the coast has repeatedly experiencing large tsunamis following historical interplate earthquakes (Fig. 2(a)). While the southern part along the Pacific coast has nearly straight shorelines and well developed coastal lowlands, the northern part (the Sanriku coastal region) has typical ria coastlines and poorly developed coastal lowlands (Fig. 2(b)). Multiple sand layers are identified between muddy or peaty sediments in drilled core samples to a depth of 1-5.5 m at several coastal areas, which are located at back swamp of beach ridges and natural levees. Fig. 2. 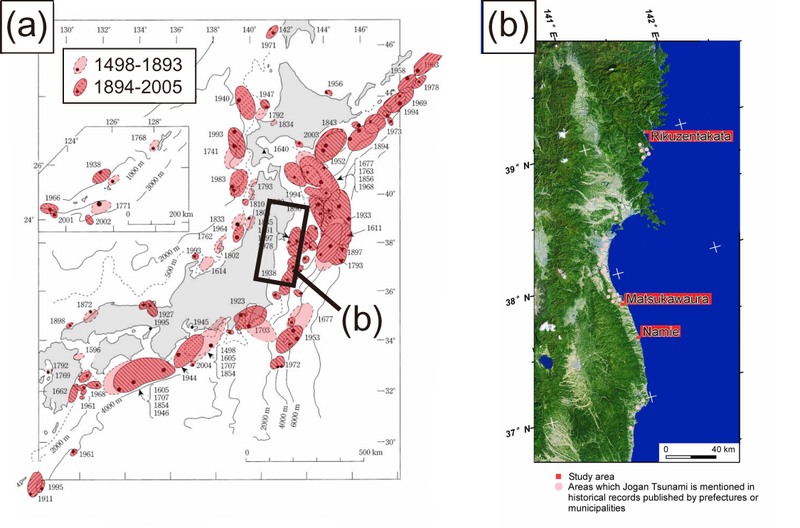 Study area: (a) Distribution of assumed Tsunami source areas around Japan during 1498-2005 (after Hatori, 2007). (b) Landsat image of the study area. Rikuzentakata is the only place where event deposits newer than 1 ka are confirmed along the Sanriku coast. The site is located in back swamp behind the beach ridge with altitude no more than 1 m (Fig. 3(a)(b)). Five event deposits are identified here, all of which are younger than 1000 yr cal BP (Fig. 3(c)) . The newer three deposits may correspond to AD 1960, 1896 and 1611 earthquakes, while older two deposits may correspond to unknown tsunamis. Fig. 3. Rikuzentakata: (a) Geomorphological map of Rikuzentakata Plain, (b) Geologic profile of Rikuzentakata Plain. (c) Geologic column, C14 ages and the accumulation curve at Rikuzentakata Plain. (d) Photo of latest event deposits (AD 1960 Chilean Tsunami?) observed within 1 m of column GS_T1. The range of altitude is -0.75 to -0.2 masl. The site is located in back marsh behind the beach ridge with altitude no more than 0m (Fig. 4(a)(b)). Eight (seven?) event deposits are identified here (Fig. 4(c)). The oldest one dates back to 5000 yr cal BP. 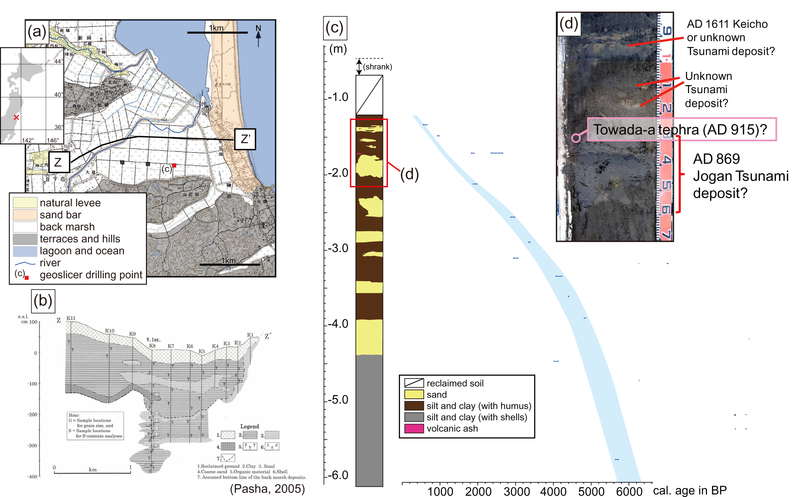 The deposit at about -2.0 masl is inferred to be Jogan tsunami deposit (AD 869), since it is just under the block of volcanic glasses which corresponds to Towada-a tephra, AD 915 (Fig. 4(d)). Fig. 4. Matsukawaura: (a) Geomorphological map of Matsukawaura. (b) Geologic profile of Matsukawaura. (c) Geologic column, C14 ages and the accumulation urve at Matsukawaura. (d) Photo of event deposits within column (c). The site is located at Holocene marine terrace with altitude about 5 m behind the beach ridge (Fig. 5(a)(b)). 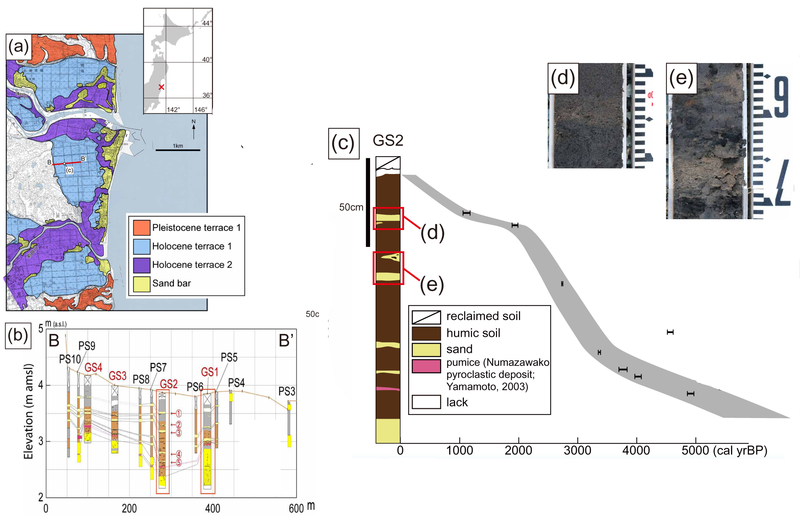 Five event deposits are identified, depositional ages of which are 1100, 2300, 2600, 3300 and 3800 years cal yBP, respectively (Fig.5(c)). The age of latest event suggests that the event corresponds to Jogan tsunami (AD 869). Fig. 5. Namie: (a) Geomorphological map of Namie. (b) Geologic profile at Namie. (c) Geologic column, C14 ages and the accumulation curve at Namie. (d)(e) Photo of event deposits within column (c). (1) While Jogan Tsunami (AD 869) was recognized in Matsukawaura and Namie as well as in Sendai Plain (Fig. 4(c)(d), Fig. 5(c)), it was not recognized in Rikuzentakata (Fig. 3(c)). We hypothesize that Jogan tsunami attacked Rikuzentakata before the formation of lagoons and back swamp which can preserve some event deposits. (2) The results at Rikuzentakata and Matsukawaura suggest that one or two unknown tsunami events occurred at approximately 800-500 yr BP (Fig. 3(c), Fig. 4(c), Fig. 6), which are also reported at Ishinomaki Plain and Sendai Plain (Fig. 6; Shishikura et al., 2007; Sawai et al., 2007; 2008). (3) In both northern and the southern part along the Pacific coast, sand layers suggest that huge tsunamis have occurred at few hundred years intervals over the past 5,000 years (Fig. 6). However, most of the depositional ages of the sand layers in the northern coast do not coincide with those of the southern coast, which might reflect the fact that northern and southern coast have experienced tsunamis from different source areas, respectively (Fig. 2(a)). Fig. 6. 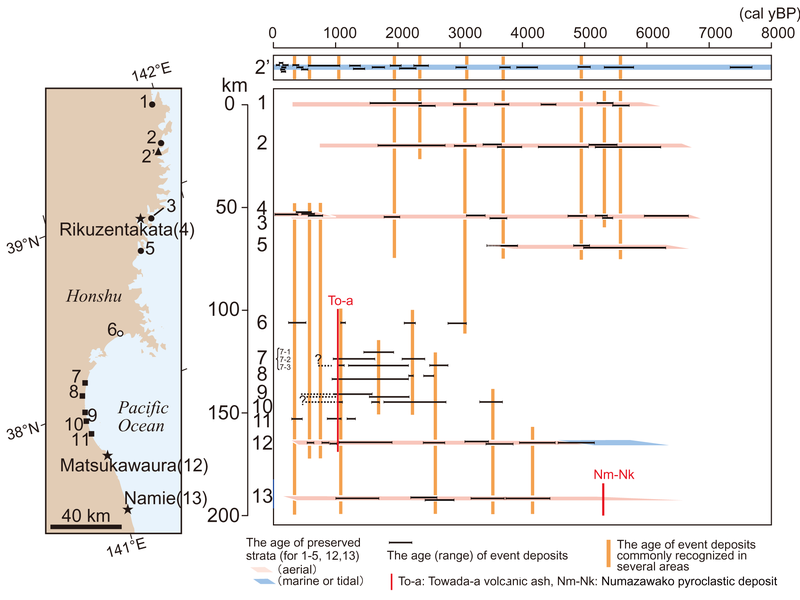 Distribution of Holocene event deposits along Pacific coast of northeast Japan (compiling the result of Haraguchi et al., 2006; 2009; Shishikura et al. ,2007; Sawai et al, 2007; 2008, and this study). The results in this article had been previously presented at American Geophysical Union Fall Meeting 2009, 14-18 December, Moscone Convention Center, San Francisco.